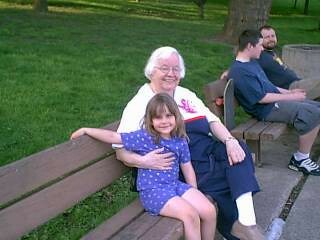 This is my 3rd Mother's Day without Mom and I still think about her every single day. Today the diocese is having special masses at the cemeteries for Mother's Day and I'm going to go. As time goes by I appreciate the time I had with her more and more, but there were certain things that I remember and appreciate most of all. I hope I can be even 1/10th the example to my kids that she was to me. 1. Mom was a devout prayer warrior. She prayed every single morning in her room without fail - even if that meant she had to get up extra early to do it. And my sister and I were aware that she was in her room with her prayer books, in her chair praying. When I was little I thought it was mystical, as a teen I admit it was annoying, and as an adult I find it admirable. And now that I have mom's prayer books I am amazed at all the little marks and prayer cards she had and I KNOW everyone that she prayed for. 2. Mom was a voracious reader. She always had a book or a newspaper going. She read the last Harry Potter book in a day when she was in her late 70s. When she died I looked through her glasses and I was amazed at how strong her prescription was! Yet poor eyesight did not keep her from always reading and learning new things. 3. Mom bloomed where she was planted. 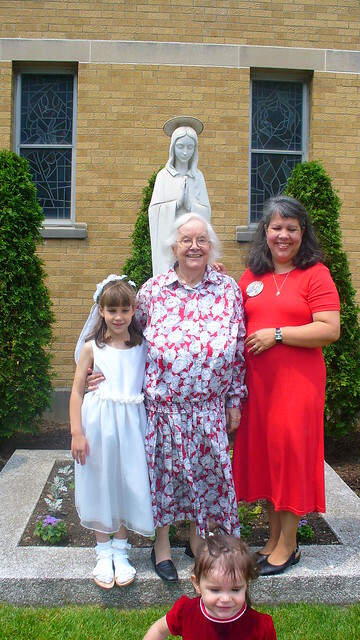 She went to St. Mary's College and Michigan State University and made lifelong friends in both places. When she married my dad and moved out to New Mexico in 1958 she started a teaching job right away and again made friends with the folks there - folks that remembered her through the years and were happy to see her when she moved back 30 years later! When mom moved into her first condo she made friends with all of her neighbors, and when she moved to an apartment and then to the retirement home she made lots of friends along the way. She was just very interested in people and listening to their stories. 4. And all that reading and listening paid off. So many people told me how interesting my mother was! She knew a little bit about a lot of things and people just found her fascinating. She was the one you wanted on your team for games like Jeopardy or Trivial Pursuit. 5. She was so good with little kids. My earliest memories were of walking down the country lane with my mom while she pointed out Queen Ann's Lace and the call of the Bob White Quail. And I remember being overwhelmed as a new mom with my 4th and 5th children asking her if she would just come over every day to rock the baby so that I could get some work done. She LOVED that. A job where she could hold the babies and read or watch t.v. - that was mom's dream job. 6. She loved a good story. Books were her favorite, but she could get hooked on a good t.v. show or movie too. In her later years we often talked about the soap operas and what would happen next - same with movies. She even found a way to connect with Mr. Pete over their shared passion for Sci Fi! 7. Mom loved animals. She was always taking the numerous barn cats that hung around our farm to the vet for shots and medications. She fed strays and even adopted a couple. And as a grandma, whenever she came over to visit she always had a treat for my dog and one for the cat - something that my children remember as a pleasant reminder of their grandma. 8. Mom was proud of us. And she let everyone know it. So many times I would meet a new friend of hers who already knew all about me and my kids. She would even brag about us while we were there, even if we begged her not too! She was always and without fail, my #1 fan. 9. But she was also the silent confidant - the mother who would call me up and tell me that she was concerned about this and about that - giving me advice (sometimes unsolicited advice) because she thought I needed a little big of guidance or even a rebuke. Often times I would shut her down and politely tell her to mind her own business - and then admit that she was right and take her advice. Thank God - because more often than not, she was right. 10. At the end or her life Mom wanted to make sure that I knew she loved me. No past shortcomings or little grievances stood between us - mom made sure of it. All that mattered to her in the end was that I would be very sure of her love for me, without question. And that has made losing her just a little bit easier to take - knowing and feeling all of the love that she left behind.